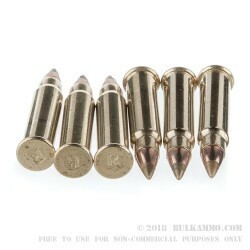 These rounds are 17 HMR rimfire rounds from American-based manufacturer Remington. 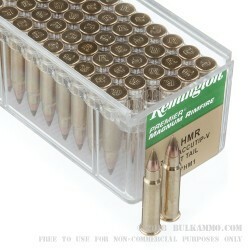 Part of Remington’s Premier Gold Box line, they are a great varmint hunting round. Each round is topped with Remington’s 17 grain AccuTip-V Boat Tail bullet. This bullet is specifically designed to ensure the perfect flight and match-level accuracy for your next hunt. Once this rounds finds its target, the bullet fragments quickly, leading to fast and humane results. It has a muzzle velocity of 2,550 feet per second. An American institution, Remington has been in business since the Madison administration (yes, James Madison). 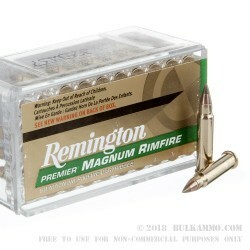 Remington’s ammo products are produced in Lonoke, Arkansas. This round stands up to Remington’s centuries-old reputation for quality manufacturing.